Through the years, ATP has thrived on connecting creative people and introducing new talent. This year, they’re trying something different, hosting a talent competition. Unsigned bands competed for the attention of record label/collective Bedroom Community, who selected one winner to perform on theircurated Friday showcase at the Andrews Theatre. 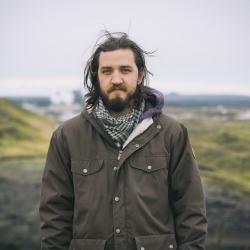 Seeking to learn more, we caught up with composer Valgeir Sigurðsson, who cofounded the label alongside Nico Muhly and Ben Frost. He told us the choice hadn’t been an easy one, but that they eventually decided to go with CeaseTone. When I bring up the unfortunate clash between Daníel Bjarnason performing on their stage and GY!BE playing the main stage, Valgeir dismisses it. “We didn’t know what the full line-up looked like when we turned in our schedule, but it doesn’t matter,” he says. “This is how festivals work, there is always something else happening.” Given how long GY!BE are playing, Valgeir humbly suggests that people just go see them once Daníel finishes his set. Next: All Tomorrow’s Parties Are Happening RIGHT NOW! Previous: ATP Special: What To Do In Keflavík!